Maintained by Joe Lau, Philosophy Department, University of Hong Kong. Start from the first module to learn critical thinking! The hardest logic puzzle in the world! Are your moral beliefs consistent? 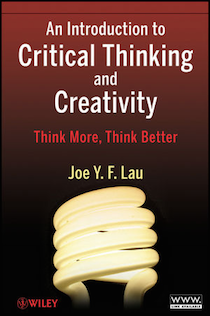 This book provides a more detailed treatment of many of the topics on our website:	An Introduction to Critical Thinking and Creativity: Think More, Think Better. (Wiley, 2011). Written by Joe Lau, author of this website. More details. Want to read more? We recommend these books.